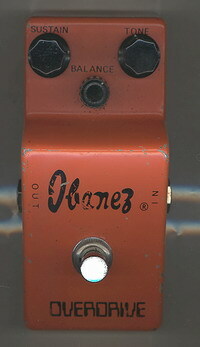 This is the original narrow box overdrive from Ibanez. 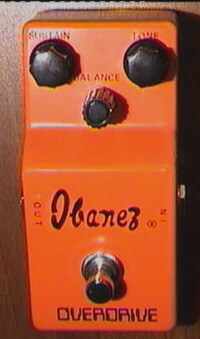 From the first series of effects the v1 'Ibanez OD-850' was produced in the mid 70's. Distinctive from later versions by the script logo and stripped down black labelling. The funny part is that this isn't really an overdrive at all. It falls much more closely in the vein of the 'big muff,' which is a fuzz. There are some slight changes to this design that make it unique among the rest. 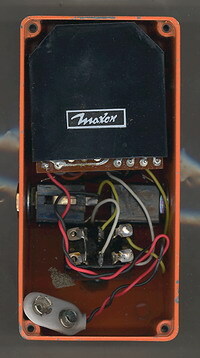 It has a modified tone stack and a more modern, smaller box.This fuzz has a fat and open sound with lots of bloom. It sounds overloaded and very musical. It seems to have an extra underlying sweetness in the low mids that rounds out the sound and gives it a nice woolly feel. The tone gets almost three dimensional with broken chords and straight picked notes. I'm sure you've heard of the "wall of sound," well to me this is it. Complete saturation, like a massive sonic bear hug, it is hard to escape. What really sets this pedal apart from its not so distant cousins is the fact that it doesn't have the shrill top end that alot of big muffs can get at the upper end of the dial. It seems to reach a more organic state than most pedals of this style (If that could ever be said about a fuzz). It is a pedal that I immediately liked. I won't say that I was blown away by what it had to offer but more that it was what I expected it would be from what I've heard about it. It is a familiar sound that just seems to have more sweetness, and usability. 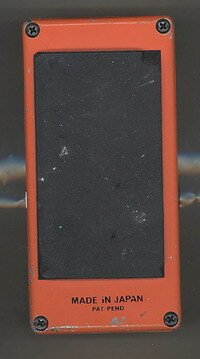 The controls are 'Sustain', which controls the amount of gain. 'Balance',controls the level of output. And 'Tone' which ranges from bass to treble. Very conventional to this type of fuzz, and familiar to all of us who know the 'big muff'. Although, the tone control has less range than your typical 'muff,' it is usable at every setting. In many ways this one reminds me of the green Russian muff most, because of it's darker character and fluffy quality. It seems to achieve a more earthy tone, and has very little scoop. There is a very present mid range but it is less pronounced than the low end. I would say that the sustain knob has less sweep than your typical muff as well. It can achieve a nice slight gain tone at the low end of the dial. From there it ramps up into pure saturation. It can get a little muddy at times but overall it delivers a smooth, sustaining sound on the high notes. And an overblown, heavy tone with chords. All in all it is very usable, and a nice alternative to the typical muff. The smaller size lends itself to pedal boards, while keeping the credibility of being a vintage pedal.